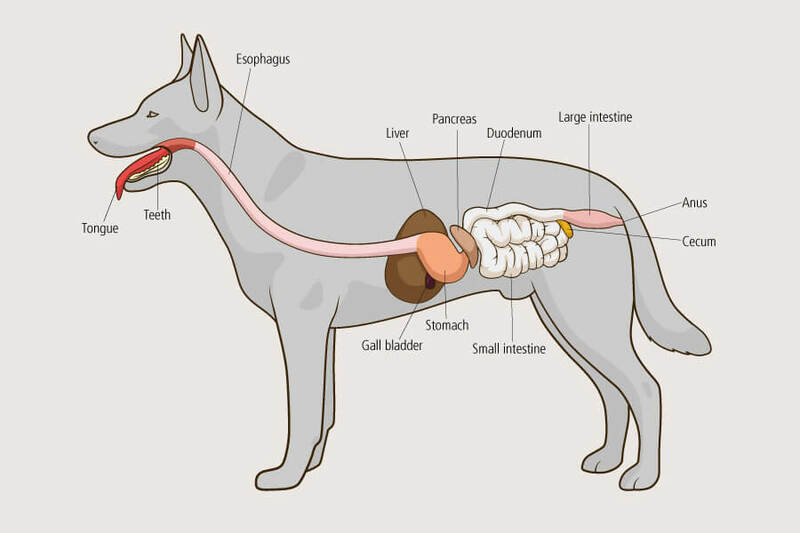 Your dog’s digestive system is the combined functions of the mouth, teeth, salivary glands, esophagus, stomach, intestine, pancreas, liver and gall bladder. Digestion starts when food is placed in your dog’s mouth. Once swallowed, it begins its journey down the oesophagus into the stomach where it will be broken down into a liquid called chyme which then passes into the small intestine. This is where the main part of the digestion takes place. Assisted by the liver and pancreas the nutrients are adsorbed into the blood stream. When the small intestine has done its job, the remaining food will pass into the large intestine (colon) whose main function is to extract any remaining water and nutrients. When this is done, what’s left is waste material that your dog’s body has no use for and it is going to become the stool. A healthy digestive system is the foundation of overall health. You can feed your dog a high quality food but it won’t matter if the digestive system is compromised and nutrients aren’t absorbed. There are many reasons why the digestive system might be compromised and proper diagnosis is often a difficult challenge. The good news is that, once detected, nutritional management will often show great improvement regardless of the cause. The best food for your dog will depend on where the problem originates and his or her dietary history. Protein is essential for proper immune function and to repair damaged intestinal tissue and it is therefore important not to feed too little protein. Protein quality is as important as quantity, so protein sources with high digestibility and bioavailability should be fed. If the gastrointestinal condition is believed to be immune-mediated, an elimination diet must be fed, the principle of which is based on feeding a food containing proteins that your dog has never previously been fed. Fats are significantly more difficult to digest than other nutrients and therefore low fat diets are sometimes recommended. Looking at the Omega 6:3 ratios and increasing Omega 3 has been proved to have a positive effect as well. An alternative to a low fat diet is one that contains medium-chain triglycerides (MCTs), found in coconut oil. Unlike other fats, medium-chain triglycerides do not require pancreatic lipase and bile salts for digestion, thus making them ideal for dogs with impaired fat digestion. While some dogs with a gastrointestinal condition can eat grains that are easily digested and gluten-free, other dogs improve dramatically when all grains are removed from their diet and a vegetable starch such as sweet potato is fed instead. In some cases, however, the problem isn’t just grain, but all starches. Fibre can be helpful in large intestine conditions but is contraindicated in conditions of the small intestine. In the case of the former, a blend of soluble and insoluble fibre is often recommended. Several supplements can help with digestive disorders. L-Glutamine may help protect and repair the lining of the digestive tract. Fish oils reduce inflammation. Probiotics help restore a healthy microbial balance by adding ‘friendly’ bacteria to the dog’s intestines. This, in turn, can help protect against the overgrowth of pathogenic bacteria (the bad guys). A digestive enzyme supplement may be able to help some dogs who have difficulty absorbing adequate nutrients from their food. This entry was posted in Blog and tagged dog digestive system, dog food, GI systems.